As the current policies of the U.S. in Syria raise eyebrows in Ankara, the resolution of differences remains a far prospect if the U.S. insists on defending its missteps, particularly over Washington's support for the PKK's Syria branch and also the Gülenist Terror Group (FETÖ). The recent murder of Saudi Journalist Jamal Khashoggi is also expected to be one of the key topics in the Erdoğan-Trump meeting on the sidelines in Paris. 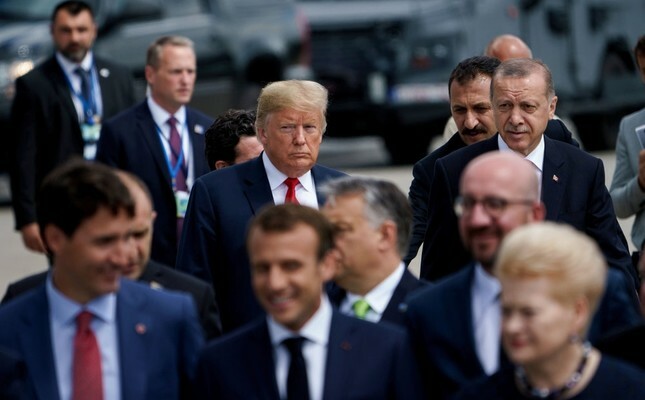 Erdoğan and Trump are expected to discuss a wide range of issues that have amassed since their last comprehensive meeting in New York on Sept. 21, 2017. "In his meeting with Trump, Erdoğan may first welcome the recent step of the U.S. to put bounties on senior PKK leaders. Yet, he will also clearly underline that Turkey will oppose any attempt by the U.S. to differentiate the PKK from its Syrian affiliate the People's Protection Units [YPG]," Murat Yeşiltaş, an academic at Ankara Social Science University and director of Security Studies at the Foundation for Political, Economic and Social Research (SETA) said. He underscored that Erdoğan will highlight Turkey's red line in Syria and its expectations from the U.S. The YPG's ultimate aim is to establish an autonomous region in northern Syria by connecting the northwestern Afrin canton to the Kobani and Jazeera cantons in the northeast, which would provide the group access to the Mediterranean Sea. On Jan. 20, Turkey launched Operation Olive Branch to push YPG and Daesh terrorists from northwestern Syria's Afrin region. On March 18, Turkish troops and affiliated Free Syrian Army (FSA) forces liberated Afrin district center, a move that has put a large dent in the group's plans in the region. On Tuesday, the U.S. announced a combined $12 million reward for senior PKK leaders while backing its Syrian offshoot the YPG by providing training, arms and military equipment. The U.S. Department of State's Rewards for Justice program authorized up to $5 million for information on PKK's acting leader Murat Karayılan, $4 million for Cemil Bayık and $3 million for Duran Kalkan. Defense Minister Hulusi Akar commented on the presence of terror groups in Syria yesterday saying, "We will not allow any terror corridor in northern Syria and Iraq. We are continuing our efforts east of the Euphrates river." "The U.S. is one of the key actors in Syria and its aim is to act as hegemonic leader in the region by establishing permanent influence. By arming and supporting the YPG in Syria, the U.S keeps its stake in the conflict and the region as a whole," Valeria Gionnatta, an academic from the University of the Turkish Aeronautical Association, said. While Ankara has been strongly rejecting the U.S.' efforts to justify its partnership with the YPG, the U.S. has been calling the terror group their partners and stressing that the YPG "is effectively fighting against Daesh." U.S. Special Representative for Syria James Jeffrey said Wednesday that while the U.S. "understood" Turkey's security concerns regarding the ties between the PKK and YPG, it does not consider the YPG a terrorist group. "Our position on the PKK is clear, but we do not classify the YPG as a terror organization. We never did," Jeffrey said. "We understand Turkey's security concerns. We understand the concern over ties between PKK and YPG. That's why we are acting very, very carefully. We inform Turkey about what we do and why we do it." The statements coming from the U.S. have been failing to allay Turkey's concerns. Turkish and U.S. troops began joints patrols on Nov. 1 as part of the Manbij road map which focuses on the withdrawal of the YPG from the northern Syrian city. The second round of joint patrols were conducted on Thursday. "Both the U.S. and Turkey have already tested the limits of their reciprocal relations and even though some divisive issues remain, some contingencies are pushing for moving toward a positive dialogue," Gionnatta said commenting on the future of ties and stressing the importance of continuing dialogue. "The second most important issue that will be discussed by the leaders may be the killing of Saudi journalist Jamal Khashoggi. Erdoğan might share further information about the murder of the journalist as Turkey expects more steps from the U.S. to mount pressure on Saudis," Yeşiltaş added. Istanbul's Chief Public Prosecutor İrfan Fidan, who is leading the investigation, announced last week that Khashoggi, who lived in self-imposed exile in the United States, was strangled immediately after he entered the Saudi Consulate in Istanbul on Oct. 2, as part of a premeditated killing and that his body was dismembered before being removed. The case has brought near unprecedented international scrutiny on Saudi Arabia and its powerful Crown Prince Mohammed bin Salman, also known as MBS, whom Khashoggi had criticized. The extradition of the Gülenist Terror Group (FETÖ) leader who orchestrated the July 15 coup attempt in 2016, where 251 people died and nearly 2,200 were injured, is also expected to be discussed in the meetings between the two leaders. Erdoğan will draw attention to the issue, which has slipped from the agenda recently, and reiterate Turkey's demands for extradition.